President Bush toured a North Carolina textile mill on Friday to try to drum up weak Southern support for his free trade pact with Central America. "Get that bill to my desk," Mr. Bush said in remarks aimed at Congress, saying it would help bring more jobs to the United States, not threaten them as critics of the pact contend. Mr. Bush toured the R.L. Stowe Mills plant in nearby Belmont, N.C. and stood among giant spools of white cotton thread and 480-pound bales of raw cotton. 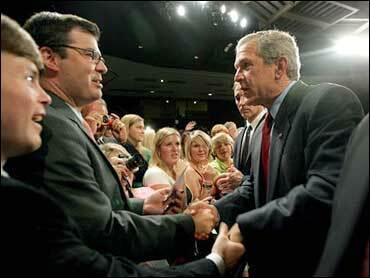 Then he appealed for the treaty's support in a speech at the Gaston Community College here. The president mixed promoting the trade pact with talking about the ongoing war on terror and the conflict in Iraq. "We will complete the mission," he said. He also trumpeted "25 consecutive months of jobs gains." He said that CAFTA was "a historic opportunity" to take advantage of the recovering economy. Ahead of his visit, Mr. Bush met at the White House with President Antonio Saca of El Salvador, one of the countries that is a party to the trade agreement. The two leaders sat alongside each other in the Oval Office during a brief picture-taking session. The Central American Free Trade Agreement passed the Senate on a 54-45 vote two weeks ago. It could come up as early as next week in the House, where its fate is less certain. It faces near-solid Democratic opposition and only lukewarm GOP support. Mr. Bush's visit was to the district of Rep. Sue Myrick, R-N.C., the only one of North Carolina's 13-member House delegation to publicly endorse the measure. She accompanied him here on Air Force One. Also with Mr. Bush was his embattled deputy chief of staff, Karl Rove, currently at the center of a controversy over his role in a leak that disclosed the identity of a CIA officer. A youthful protester with a sign, "Fire Bush's Brain," stood along Mr. Bush's motorcade route. It was a reference to one of Rove's nicknames, "Bush's Brain." In a light moment, Rove handed a reporter a half-filled container of Tylenol PM and joked, "You look like you need this." The trade agreement, signed by the United States a year ago, would end or sharply lower trade barriers with the five Central American countries of Costa Rica, El Salvador, Guatemala, Honduras and Nicaragua. It would also apply to the Dominican Republic, a Caribbean nation. "This deal is a good deal for workers," Mr. Bush said, adding that the measure would also support emerging democracies in Central America. "Central America is the second largest market in the world for our textile products. So if you're a textile worker, it seems to me you ask, where do we sell our textiles?" Mr. Bush said. It would also help stabilize trade between the United States and the region, Mr. Bush said. North Carolina is one of the hotbeds of opposition to the pact, which is modeled on the North American Free Trade Agreement passed 12 years ago that established free trade among the United States, Canada and Mexico. Critics contend CAFTA will cost U.S. jobs by making it easier for U.S. companies to relocate operations in Central America, where labor costs are lower. The White House argues the opposite, asserting it will bring jobs to the United States. Mr. Bush contends the pact would be "good for American workers, good for our farmers and good for small businesses" and "help increase sales abroad and job creation at home." The textile industry is divided on CAFTA. Some are opposed because of an inherent mistrust of any free trade deal. Others say it will help the U.S. industry because it will help Central American manufacturers, who buy material and yarn from the United States. Chinese textiles, by contrast, have little or no U.S. content. CAFTA would further open a market of 44 million people by eliminating trade barriers to U.S. manufactured and farm goods, protecting trademarks and other intellectual property and establishing legal frameworks for U.S. investment. Last year the region purchased about $15 billion worth of U.S. goods. Many Democrats argue that inadequate worker rights provisions in the agreement will lead to labor abuses. It is also opposed by lawmakers from sugar beet and sugar cane-growing areas, and others who link free trade to America's soaring trade deficits. House Minority Leader Nancy Pelosi, D-Calif., said the fact that GOP House leaders haven't yet brought the bill up could be a sign that it lacks the votes. "I can't really speak with authority on the number of Republican votes that are 'no' on CAFTA, but I hear that it is a significant number," she told reporters. "I know that there are only a small number of Democrats who would be supporting it, so I think they are in trouble on CAFTA."